Today, the U.S. Supreme Court will hear arguments in the Texas death penalty case of Duane Buck. 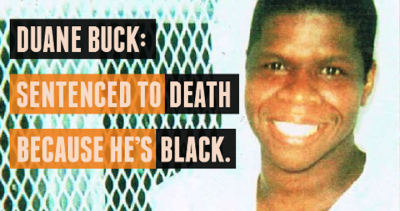 Buck was sentenced to death after his own lawyer called an “expert” who testified that Buck was more likely to be dangerous in the future because he is black. At this crucial moment, when our nation is confronting hard truths about race and the criminal justice system, the U.S. Supreme Court will decide whether this blatantly racist testimony will be allowed to stand or whether Buck must receive a new sentencing hearing, free of racial bias. In order to be sentenced to death in Texas, a jury must decide that a person is likely to be a “future danger” to society. Buck’s own lawyer called an “expert” witness, who testified that Buck was more likely to be dangerous in the future because he is black. The prosecutor reiterated this inaccurate and offensive racial claim. By the time the jury began their deliberations, they had heard it four times without any objection from Buck’s lawyer, and Buck was sentenced to death. In addition to this pivotal failure of Buck’s original lawyer, his lawyer during a key state appeal also failed to challenge the original lawyer’s misconduct. For over a decade, Buck has tried to argue that the ineffectiveness of his original trial lawyers warrant a new sentencing hearing. Imposing procedural rules, courts have refused to consider that argument on its merits. Now, Buck is asking the U.S. Supreme Court to find that lower courts “imposed an improper and unduly burdensome” standard – a standard that prevented him from having his case of ineffective assistance of counsel heard on its merits. “It is incomprehensible that a lawyer defending an African-American man facing the death penalty would knowingly introduce ‘expert’ testimony linking race to dangerousness,” said Christina Swarns, counsel of record for Duane Buck and Director of Litigation at the NAACP Legal Defense Fund. “And the American public cannot and will not have confidence in a court system that turns a blind eye to such explicit discrimination.” Buck is also represented by Kathryn Kase and Kate Black of Texas Defender Service. A group of former prosecutors, the National Black Law Students Association, the Constitutional Accountability Center, the Lawyers’ Committee for Civil Rights Under Law, and the National and Texas Associations of Criminal Defense Lawyers have all filed briefs with the Supreme Court, arguing in favor of Buck. The briefs powerfully address several issues, including the longstanding, false and pervasive stereotype of black people as dangerous and the need for a new sentencing hearing in Buck’s case. Check out the video below, which highlights the racial discrimination in Duane Buck’s case and in the Texas death penalty system. The video is narrated by former Texas Governor Mark White and includes a prosecutor from Buck’s original trial, a surviving victim of the crime, leading civil rights figures in Texas, and others calling for a new, fair sentencing hearing for Buck. Watch this space for news of when the Supreme Court makes its decision in the case. We hope to eventually share the good news that Buck will get the new sentencing hearing that he was promised.